In-Fisherman Freshwater Trophies Game Review - Download and Play Free Version! Hop in the boat, cast your line and get ready for the fight of your life! Are you one of those people who think waking up at 5 to go fishing is a good idea? Or, even worse, would you stay up past midnight so you could catch your limit for two days on one trip? Yes, you have issues. Fortunately for you, you are not alone! The good folks at In-Fisherman magazine suffer from the same malady as you do. Catching a big mouth bass is exciting to them as well; so when they made a fishing game, they insisted upon a realistic and exciting game that a real fisherman would enjoy! This authentic fishing game will blow you away! A 3D camera will allow you to be involved at every angle of the catch. Go below water or stay above with this wonderful graphical interface! Cruise the lake, cast in your line and watch as a perfectly modeled, animation-blended bass grabs your lure during any of the game's many high-stakes fishing tournaments. You will become a better fisherman in real (or should we say reel) life too as you will learn from the editors many accurate and unknown fishing tips as you play this addicting fishing game! In-Fisherman: Freshwater Trophies is an exciting and realistic fishing game that will have you angling to catch a variety of fish species. You can fish on several different lakes that each offer their own unique combination of fish, weather, and water clarity. Change your fishing pole and lures to catch more fish or go for a single type. An underwater camera lets you see all the action of the fish and your lures. Add in the detailed graphics and you've got one heck of a game. You start off by creating a profile. You'll select how your fisherman looks, the difficulty level, and the name you want. You can then select which mode you want to play. After selecting the mode, you'll pick the boat you want to use (and other options such as weather or time of day depending on the mode). When you finish choosing all the options and start fishing, you'll be put on a lake in a boat. You can drive the boat around to a spot you want on the lake and begin casting. You'll pick a spot, cast, and then slowly reel the line in. You continue this pattern until you either quit or run out of room on your boat to keep the fish you catch. There are several different lakes in the game where you can fish. You can fish in Lake Coeur d'Alene in Idaho, Lake Okeechobee in Florida, Lake of the Woods in Minnesota, and more. Each lakes brings its own unique selection of fish and layout. The lake you fish on also has an effect on the type of weather you'll experience. Even the clarity of the water will change depending on the lake, ranging in visibility from crystal clear to cloudy and muddy. In-Fisherman offers a few modes of play as well. Fish Trip lets you pick the lake you want to fish on, the season, the weather, and the clarity of the water. In this mode, you fish as much as you want to without any restrictions or limits. The Tournament mode lets you choose the season, duration of the tournament, and the type of fish to catch. You'll have however long you choose to catch as many of the type of fish you pick. Larger fish are worth more than smaller fish. Whoever manages the largest size and number of fish wins. The Career mode is similar to the Tournament mode, except that it you puts you in a series of tournaments. 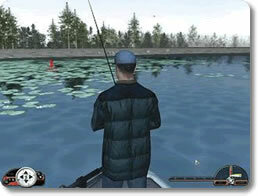 The game also offers a multiplayer option that allows up to eight players to fish on a lake in either a Fishing Trip or Tournament. However, there is no real online community or presence (although you could put a game together with some friends). The possible drawback for the modes is that there's not much difference in the gameplay between any of the modes. The game offers three different choices for the difficulty level when creating a profile, and this difficulty level can be changed later to be higher or lower. This allows you to find a challenge that's right for you. However, it will still be a challenge when it comes to simply learning how to play. The game provides no real introduction or tutorial. As a result, those less familiar with fishing may not know how to properly use lures or what types of lures to use. There are fishing tips that give some insight into what kind of lure to use for what fish and the technique to use, but they aren't always clear or helpful. When you first start playing you may be able to cast a lure and get a fish to bite, but you might not be able to hook the fish or reel it in without the line snapping. You'll still be able to catch fish even without the knowledge, but a tutorial would have been a nice addition. The controls in In-Fisherman are simple enough to use, but have their drawbacks as well. You cannot change or customize the controls. You can only look up or see the controls on the loading screen before and after levels. This makes it a bit more difficult to learn and remember all the controls. Once you do, however, they are easy to use. The presentation is one of the great parts of this game. The graphics are high quality and realistic. The fish are all detailed and distinct in their appearance. The water looks excellent, and you can even see plants and logs on the bottom of lakes. The lures are colorful and authentic. The sounds add to the realism and enjoyment. The presentation is excellently done and really improves the game. 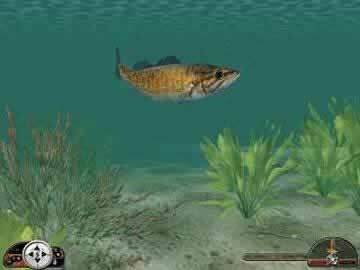 Overall, In-Fisherman: Freshwater Trophies is a great choice for anyone interested in fishing who is looking for a fun and realistic fishing game. Other players can play as well, although if you have no real interest or enjoyment in fishing there isn't anything offered for you in this game. The lack of a tutorial or customizable controls may get you off to a slow start, but once you've learned the game it becomes easier and provides a great deal of entertainment. There are a bunch of different fish species to catch, and a ton of lures to catch them with. Fish on any of a number of real and authentic lakes. You can have a relaxing experience in the Fishing Trip mode or race against time in Tournament mode. 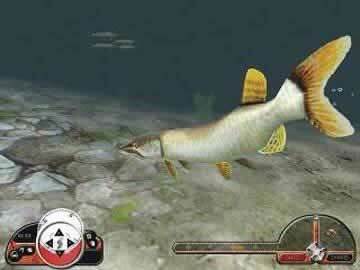 This game is well worth playing for any fishing enthusiast.